I attended the live performance of "The Taming Of The Shrew" during one of the weekends the cast was performing. 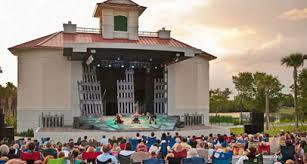 The backdrop of the Seabreeze amphitheater is Carlin Park in Jupiter which can not have a better scenery. You can smell the salt air from the ocean across the street and feel the nice breeze. This performance was great with a southern twist thrown into the plot to spice up Shakespeare's normal rendition. I laid out a blanket and brought my own beverages. The pleasant host came around to collect donations for the performance in which $5.00 was suggested and I gladly gave $10.00. There was a gourmet grilled cheese stand and ice cream truck peddling delectable snack perfect for an outdoor evening play! The costumes were just as on target as the performers. I watched as southern charm twist was swirled into a classic old English comedy. This was a great opportunity to enjoy live entertainment at an outdoor venue for close to free! Everyone should head to Seabreeze amphitheater in Carlin Park next year if you did not make it to the event this year. Jupiter has this secret theater tucked away in west Carlin Park and everyone should know about all the events they show case for the public!